Insulated glass units (IGU) are double- or triple-pane windows that are insulated for better energy efficiency. While they typically do not exist in older homes, they are installed in nearly every newly constructed home today. Between the panes of glass is either air or an inert gas like krypton or argon. 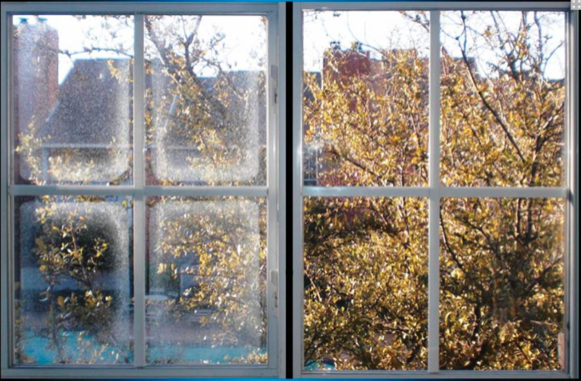 One of the most common problems with these types of windows is a fogged IGU. What Is a Fogged IGU? If you’ve ever seen a window with fog or condensation between the two panes of glass, you’ve probably seen a fogged IGU. What has happened is the seal around possibly just one of the units has acquired a gap, allowing the air or gas to get out. If air can get out, air can get in. That is when condensation builds and the glass develops a fog. Depending on the weather, the fog may appear and disappear multiple times throughout the year. The good news is there is a solution for a fogged IGU. You can’t actually get in between the panes to clean the glass, and it’s not possible to repair the seal and have the IGU work as it is supposed to. So what’s the solution? Replacing just the glass portion of the window in question. Left in place are the frame and the sash, and new glass panes are then installed. Yes! Every situation is different, but in more cases than not, it’s more cost effective to repair the damage than to replace the entire window. If you feel the window is on its last leg and a repair would only last a short amount of time until you replace the window, a replacement might be a more cost-effective option. If you wonder whether or not you have fogged IGUs in your windows, contact the professionals at S. Albert Glass today by calling 301-517-7442 or sending an email today!